The New York Times has a fascinating update on Amazon's move into the fashion category. Both online and offline retailers cringe at Amazon's lowest-price strategy, but Amazon.com CEO Jeff Bezos told the Times the company would not take its low-price approach when it comes to fashion. "There's a sophisticated markdown cadence in the fashion industry that we think makes sense and we're basically following that established approach," Bezos told the Times. The New York Times also wrote, "While brands sell some of the same items to different stores, they are increasingly developing exclusive colors or styles to avoid price-comparison issues." Retailers are still angry at Amazon's promotion in which it gave consumers a 5% discount on items purchased through Amazon if they use its Price Check mobile app to compare prices at brick-and mortar retailers. Target has since reportedly asked manufacturers to provide it with exclusive SKUs to make price comparisons on mobile devices more difficult for in-store shoppers. 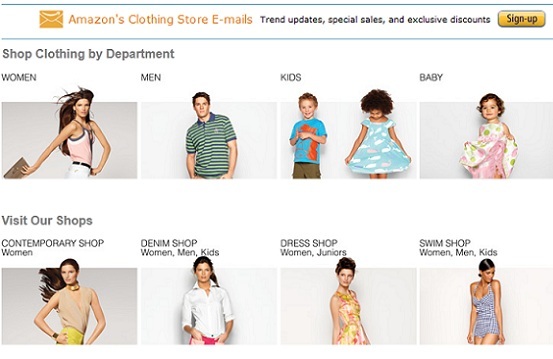 Let us know what you think of Amazon's move into fashion. Just for fun, I checked to see if I could find my husband's classic Ralph Lauren oxford button-down shirts. I did find a few... but not in his size. The prices were comparable with buying direct from the RL site, or from Macy's. With my Amazon prime I'd ''save'' on shipping (that I've basically pre-paid) but the lack of variety in sizes means that it's easier just to order direct... or buy from Macy's whenever I'm over by the mall. For the ''average-sized'' shopper who's lucky enough to wear the most common sizes, this may be a convenient way to shop. For our family, however, not so much.